It's rare that two neighbors agree on anything, especially when one of them is Samuel L. Jackson and he's just caused the other neighbor's wife to crash her car, then shoot him in the chest during a police standoff, while wild fires rage around them. For two neighbors who would never ever live on Lakeview Terrace, the dudes behind Smashtrays. 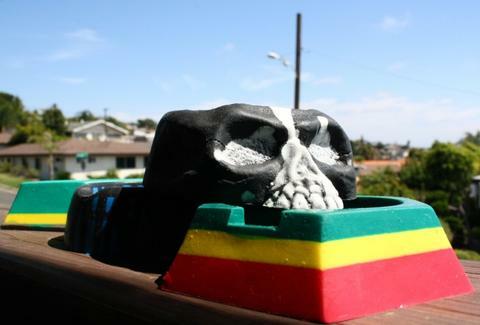 From a couple of SD hood-dwellers down with the peace pipe and tired of breaking stuff, Trays are ultra-strong, multi-purpose, flexible ashtrays designed to be glassware-friendly and virtually indestructible due to their proprietary “premium grade silicon”, presumably used because substandard silicon would so be ridiculed in Del Mar. Each number is made with a bulbous center to facilitate easy-tappage to stamp out butts and knock out cherries, while the silicon's bouncy nature ensures their survival through virtually any catastrophe, and its extra-sticky properties gives them an earthquake-proof hold on cans and bottles, also known as the "the Mel Gibson". Because every piece is completely hand-mixed and made, they each pop out of the mold unique due to the stacked/ splattered/ swirled colors, though, currently, always in one of four, mostly self-explanatory shapes: the classically circular “Roundie”, hexagonal “Hex”, the...skull “Skull”, and the most popular leaf in CA-shaped “Kaya”, clearly named for the 1969 Yugoslav film Bob Marley album. For the ultimate gifter/ egomaniac, pieces can be custom-etched with virtually anything desired, and can be ordered in any quantity pending a one-time mold fee, which probably wouldn't be required if Samuel L's sprinklers weren't always coming through those damned windows!